Sacred Heart Cathedral is situated in the heart of San Francisco’s cultural center. SHC students benefit from the prime location, near San Francisco’s City Hall, the opera and the ballet. SHC’s urban campus is ideally located for rich educational opportunities. Featuring more than 50 machines and benches, including treadmills, DanceDanceRevolution, elliptical machines, stationary bikes, Wii Fit, stair-climbers, rowers, weight benches, free weights and a range of other fitness and exercise equipment—many of which are equipped with personal cable TVs—the Fitness Center has everything our community members need to pursue their fitness goals. The spacious Fitness Center sprawls over 4,500 square feet, including the Timothy Baptista ’99 Strength Training Area, and an 800-square-foot dance studio complete with hardwood floors, mirrored walls and barres. View student hours for the Fitness Center. The Sister Caroline Collins, DC, Theater’s multipurpose design accommodates drama productions, instrumental music, choral performances and audiovisual presentations. With a ceiling height of 33 feet, the space provides performers and technical crew with an above-stage tension grid, catwalks and a professional sound and lighting control room. There are dressing rooms, storage space and a workshop for building and transporting sets. The generous, light-filled William D. Spencer ’65 & Claire Spencer Lobby also serves as a gallery to display student artwork and photography. Did you know Sacred Heart Cathedral has the largest high school library in Northern California? We are proud to offer our students an academic experience that prepares them for university-level research. All library faculty hold graduate degrees and teaching credentials. During collaboration periods, the SHC Library becomes a hub of activity with up to 200 students studying, reading, using the most up-to-date technology, working on group projects and sharing conference rooms. The library’s lofty top-floor location welcomes students with natural light, beautiful panoramic views of San Francisco and a quiet scholarly environment. The Pavilion hosts SHC's home basketball, volleyball and wrestling. The newly renovated weight room, used exclusively by our interscholastic student-athletes, features 2,740 square feet of open space, a brand-new floor and new equipment. From our own Pavilion to Kezar Stadium to AT&T Park, the Irish compete in some of the finest athletic facilities of any high school in California. Several teams practice and compete here on our own campus, but many of our athletics facilities are dotted around the map, taking advantage of some of the best training and competition facilities in San Francisco. For a detailed list of SHC Fightin' Irish Athletics locations, please visit SHC Athletics. SHC’s urban campus location is one of our best assets. In order for students, faculty, and staff to take advantage of all our location has to offer, safety and security play a primary role like any organization in San Francisco. SHC ensures a safe and secure campus through our extensively trained security personnel and safeguarded facilities. 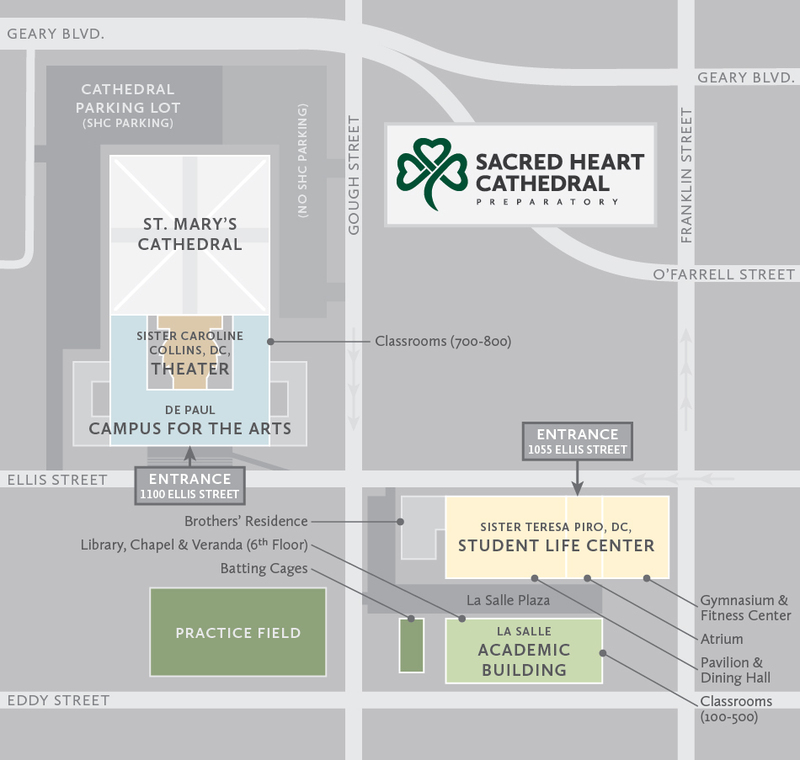 The La Salle Campus is located at 1055 Ellis between Franklin and Gough, and the De Paul Campus is at 1100 Ellis on the corner of Ellis and Gough, directly behind Saint Mary’s Cathedral. One of the major benefits of our location in the heart of the city is easy access to public transportation. Our campus is easily reached via MUNI and BART. Use the Google Maps transit planner for the most detailed instructions. From Marin: South on Golden Gate Bridge, follow signs to Lombard Street. East on Lombard to Gough, right onto Gough heading south. Entrance for parking at the Cathedral is on Gough. From the East Bay: West on Bay Bridge, follow signs to 9th St./Civic Center. Go north on 9th, using one of the two right lanes. After you cross Market, 9th becomes Larkin St. Remain on Larkin (stay in left lane) and turn left on Ellis (approx. 8 blocks up Larkin). Continue on Ellis, cross Gough and turn into the driveway leading to the Cathedral parking lot (driveway is immediately after the De Paul campus). From the Peninsula-via 101: Follow signs to 9th St./Civic Center. Go north on 9th, using one of the two right lanes. After you cross Market, 9th becomes Larkin St. Remain on Larkin (stay in left lane) and turn left on Ellis (approx. 8 blocks up Larkin). Continue on Ellis, cross Gough and turn into the driveway leading to the Cathedral parking lot (driveway is immediately after the De Paul Campus). From the Peninsula-via 280: Take San Jose Avenue exit. Proceed north on San Jose Ave. San Jose Ave. turns into Guerrero. Continue north on Guerrero St. Turn right onto Market St. Turn left onto Franklin. Turn left onto Ellis and proceed as above. Or take Highway 280 and merge at the Army Street Interchange onto Highway 101. Follow the directions for Highway 101. SHC is an urban campus. Metered, hourly street parking is available to visitors, but please be aware of time limits and restrictions concerning area permits. St. Mary’s Cathedral parking lot is often available to visitors attending evening and weekend events, but space is limited. Below is a list of nearby parking garages that assist with visitor overflow. Innovative High School serving San Francisco County, San Mateo County, Alameda County & Marin County.